Sabotage on the Eurostar Express ! Des élèves en section européenne, sous la direction de leur professeur d’anglais Samantha Lawson, ont écrit et joué une comédie loufoque tout en anglais. One day whilst sitting quietly in his study at 221a Baker Street, Detective Hemlock Soames is contacted by a mysterious character who warns him that the 4.45 Eurostar train from Paris to London will be sabotaged. He immediately rushes over to the Gare du Nord in order to carry out his enquiry. Having disguised himself as a ticket collector, he boards the threatened train. Is the criminal among the ill-assorted European passengers in the various carriages ? Or could it be the depressed and depressing driver of the train ? The more eccentric the characters he meets, the more difficult his task becomes… How will he solve the mystery ? Will he, in fact, manage to foil the plans of the evil saboteur ? 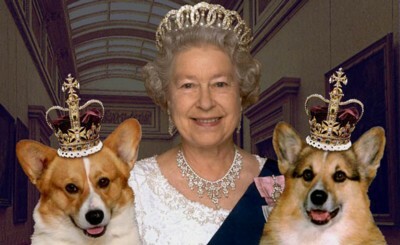 The Queen and her corgi dogs : how relevant is this ? Thank you to all those who have lent us props, including such diverse items as a Darth Vader laser sword, a smart suit, an empty vodka bottle, hats and even (Gollum’s) knickers ! With all our thanks to the technical, teaching and administrative staff of François Couperin whose help has been vital.